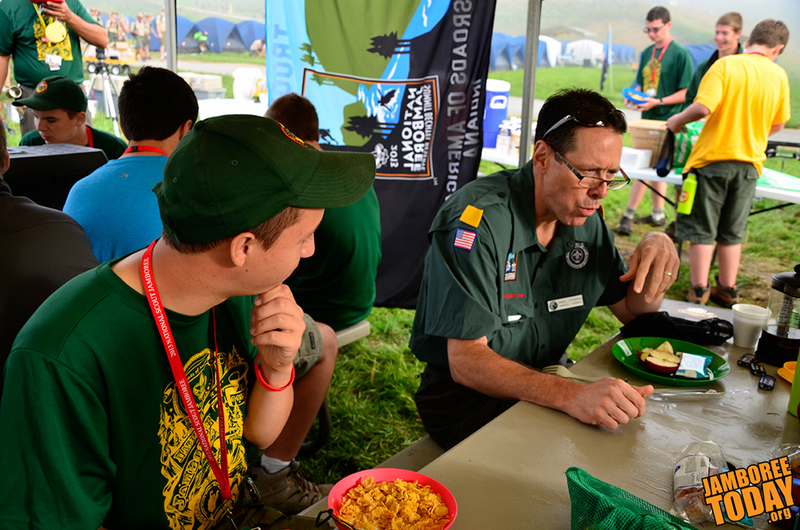 Jamboree chairman Randall Stephenson enjoys breakfast with Indiana Scouts Tuesday. Photo by Tim Underhill. When the Scouts in Jamboree Troop C217 climbed out of their tents yesterday, they weren't surprised by mountain fog, but they didn't expect to have a prominent guest for breakfast. 2013 National Scout Jamboree chairman Randall Stephenson arrived at 7:30 Tuesday morning to visit with the Scouts from Crossroads of America Council in Indiana. Stephenson said it was the first chance he had to meet with the boys who are benefiting from years of work at the Bechtel Summit Reserve. "The energy level is unbelievable, and they've already been out exploring the area, they've all kind of put together…what they want to do today, it varies from fishing to shooting to mountain biking." Stephenson said. "It is really terrific to watch them and watch their excitement." While Stephenson appreciated the variety of food choices, he politely passed on the "Blueberry Ugly" pastry in favor of the fresh apples. Senior Patrol Leader Noah Underhill was happy to share his table with the AT&T executive and appreciated the advice from the chariman. "It was pretty cool. He knew a lot and encouraged us to get out and enjoy the other activities at the jamboree," said Underhill. Even though it was his first breakfast with the Scouts, Stephenson is already looking to the future. "When we all go home, and we carry this [jamboree experience] with us, then this begins to build from there, and begin to think about what's next with the jamboree, and I think what's next is this [question] is going to become a recurring theme year in and year out," Stephenson said. Stephenson left the campsite and headed toward the AT&T Stadium to encourage the rest of the jamboree to try to "stress the system."